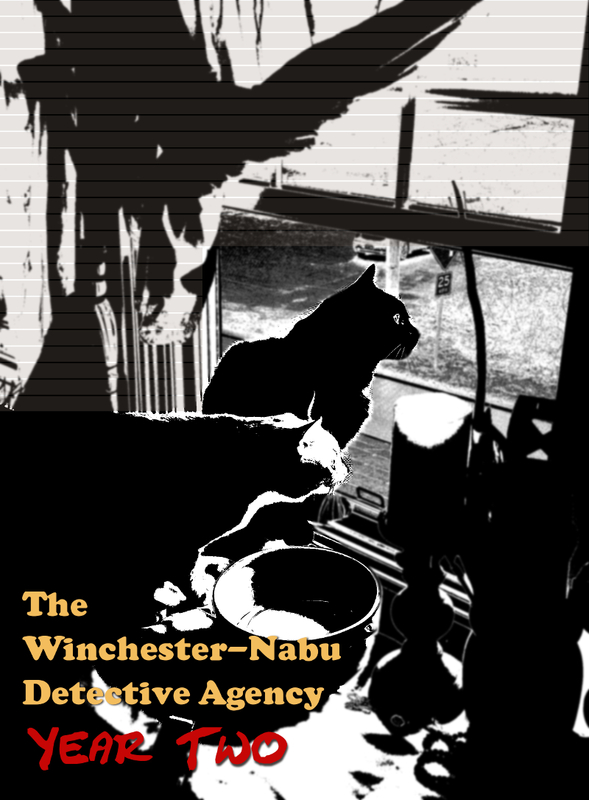 AMBER LOVE 28-JAN-2019 Catch up on Year One and previous Year Two cases at the Winchester-Nabu Detective Agency. This work is supported by the generous backers who adore my cat stories at Patreon.com/amberunmasked and they also get first access to what’s happening with my books and podcast. For a one-time tip, you can go to the new PayPal.me. In the previous case file, Gus and I had to seek cover while we were in the woods evading chainsaw murderers. Burton Guster Nabu knows when there’s prey nearby. It’s in his blood like spidey-sense. We went out the back door and up the stone pathway just like always. This time, Gus stopped at the border of the lower parking area. 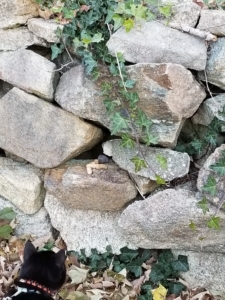 He turned and stared at the ivy-covered cinder blocks that abut the rock wall in a U shape around the cars. He craned his neck a little to each side. His nose led him to the right where the ivy spreads underneath the bushes. He jumped into the shrubs and popped back out so fast, I had no idea what he did. He walked away from me in a peppy trot. I know that walk. That’s a sure sign he had something in his jaws. 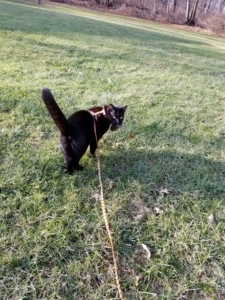 I released his leash to let him know I wasn’t holding him back. He finally stopped to look back at me and wait for me say something. It wasn’t a bird or something large like a squirrel or baby bunny. It’s not baby season anyway. It was about the size of a chipmunk but those striped fellas are hibernating right now. I had a feeling in my gut what — or rather who — Gus had in his mouth. Since the chipmunks began hibernation, Cheeks Moretti hasn’t been the one taking the peanuts from the rock wall around the cars. Yet the peanuts get taken. When it was warmer, I got a couple of glances at Cheeks’ houseguest. It was a vole and it was grateful to see me come by whenever I did. 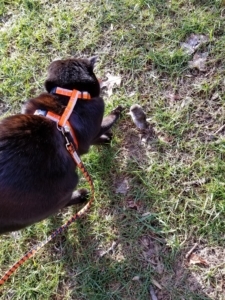 I had already saved a rather tiny vole from Gus’ clutches months ago (October 25, 2018). Volof Palme had been living in the Moretti wall for a long time. I observed him whenever Gus would allow. There were times when Cheeks would be at one entrance and Volof would be at the other end. Volof liked routine. He came to the end under the lilac bush where one of the rocks was flatter. That’s where I would pile the peanuts. He grew bigger over the fall and plumped up for winter; maybe that was the peanuts making him fat enough to survive the cold. Once you see the video if you so choose to watch the assassination, you’ll see I had no opportunity to save Volof. His belly had Gus’ fang impressions from the beginning. He hung on as long as he could and even tried to plea for his life, but Gus beat the freaking hell out of him. I was happy for Gus to be such a skilled panther, but I felt terrible that his victim was Volof. I liked Volof. He was a good egg. A courteous neighbor. I don’t know if I would’ve felt differently had it been another vole. This begs the question, what was Volof doing living with Cheeks Moretti, the chipmunk mafia boss? Did Gus know something I didn’t? That’s possible. He hardly sees me as an equal. He’s only my best friend when no one else is around. I had to talk to Oliver and see if the two of them had a file on Volof that I didn’t know about. Volof Palme, once the Prime Minister of a neighborhood largely occupied by socialist Swedish voles, and his wife Lisbet moved into the Moretti estate in the summer of 2018. An attack was made against both parties one night when they went out for an evening at the cinema. It was nearly deadly for both of them. Since they feared for their lives, they decided to have the officials issue a statement that both had indeed perished that fateful night. They didn’t go through formal channels to change their identities while seeking refuge. Instead, they went to Moretti. In exchange for safety, Moretti made them servants. They stuck close to the rocky estate. In fact, Lisbet never left it at all. Volof was too nice and gentle to be on Moretti’s security detail. He opted for less violent chores like tunnel maintenance. The attempted assassination continues to be unsolved despite over one hundred interviews of suspects and witnesses. Volof was essentially beloved by his community, but he was not without enemies. All political figures have enemies. The subsequent fatal attack on Volof Palme by DI Guster Nabu occurred on December 27, 2018. Gus was not under orders from anyone to get rid of Volof. The only assistance he received was by his human companion who took him to Moretti’s wall. Gus is inclined to believe that anyone working for the Moretti organization is fair game. No brutality charges were filed against the detective. 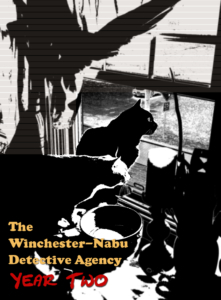 The Winchester-Nabu Detective Agency held a moment of silence was held for Volof to honor and recognize the law-abiding life he tried to live.